Is it time to rethink your investments as markets start to rotate from defensive to cyclical companies? Earnings in the US bucked a six quarter trend of declines in the three months to 30 September 2016 and there is increasing optimism about corporate profitability in Europe too. Buoyed by an improving earnings outlook and now an increasingly pro-growth agenda for government spending in a number of countries, including the US under Donald Trump, investors have started to change tactics. Defensive stocks on high price-to-earnings ratios, typically considered less ‘risky’, are being sold on many markets around the world including the UK. For example, Marmite maker Unilever (ULVR) is down 11% in the past month. Money is instead being ploughed into low price-to-earnings ratio companies with more cyclical earnings. Put simply, investors are betting that earnings for cyclical stocks could start to rise under more favourable economic conditions. While the trend has only been apparent for a few weeks, it’s worth asking whether this theme makes sense – or if investors are making a big mistake. Investors are unlikely to make decent gains in the stock market unless they invest in companies which can grow their earnings over time. Earnings growth over the past couple of years has been negligible and returns in many stock markets around the world have been poor as a result. Now there are signs that situation is changing. Third quarter earnings showed growth of 2.9% in the US: their first gain since early 2015. In Europe, earnings in the three months between July and September declined marginally across stock market-listed companies, though there is now optimism around prospects for the years ahead. All of this happened before the US elected Donald Trump as president. Big moves in stock markets, particularly an apparent shift from defensive stocks to companies with more cyclical earnings, have been explained partly by Trump’s commitment to infrastructure investment. Improving third quarter earnings in the US and Europe indicate broad-based growth may have been on the way even before Trump’s victory. Earnings are now starting to stabilise among public companies in the US and Europe after two years of declines. Commodity prices began to experience a nasty tumble in 2014, dragging down the earnings of companies in the mining and oil and gas sectors. Share prices of natural resources producers and many support services and industrial engineering companies declined as a result, weighing on the rest of the market. Prices of key commodities like oil, iron ore and copper have started to improve more recently and it is expected profitability at mining and oil companies will stabilise or even start to improve in the years ahead. Shares in Shell, for example, have gained as a result: up 35% in 2016, helping the FTSE 100 to gains of around 9%. Combining better performance in mining, oil and gas and support services with reasonable profit growth elsewhere could, if sustained, lead to a decent pick-up in stock market fortunes over the years ahead. More aggressive government spending in a number of developed countries might even accelerate these signs of underlying progress. This is typically defined as a business whose goods or services are required in both good and bad economic conditions. For example, it might be someone who makes toothpaste. We all have to clean our teeth regardless of what’s happening in the world. This is generally a business whose goods or services are leveraged to economic conditions. For example, it might be a recruitment company. It will be busy placing candidates in jobs when economic conditions are good; it will be twiddling its thumbs when economic conditions deteriorate and companies are cutting jobs. This ‘feast or famine’ can result in pronounced swings in earnings – and therefore its share price will also be very volatile. If investors can buy cyclical stocks at 10 times earnings, that can grow earnings dramatically in an economic upturn, the argument for holding low growth defensive stocks at 20 times earnings becomes less appealing. Investors appear to be rotating from defensives into cyclicals. We’ll now give some examples and ask, on a stock-by-stock basis, whether recent market moves make sense. Stocks are rarely as high quality as Compass (CPG). 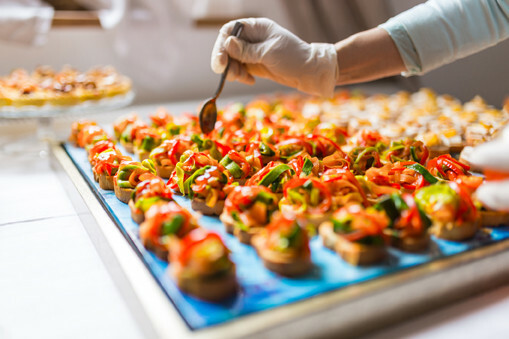 The catering business has delivered earnings per share (EPS) growth every year for at least the past nine years. Quality like that comes at a price. Food and support services specialist Compass trades at 19.7 times forecast EPS of 61p and is expected to deliver growth of around 12% year-on-year in 2016. Severfield (SFR), the UK’s market leading structural steel provider, is a different type of company entirely. Trading at just 13.8 times earnings, EPS is nevertheless expected to increase 35% from a year earlier. So does it makes to ditch the expensive defensive Compass and back a rising tide at cyclical Severfield? There are some early signs markets are starting to price an improvement in global economic activity through 2016 and 2017, an environment in which cyclical stocks like Severfield could benefit. Combined with infrastructure projects proposed by the UK Government, companies like Severfield will potentially enjoy a boost to their end-markets. In the mid-2000s, for example, in a buoyant economy and helped by projects like Heathrow Terminal Five, Severfield’s share price gained from 300p to above £22 in only a few years. Profit growth was also spectacular. 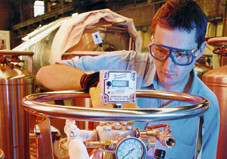 Operating profit exceeded £45m in 2008 versus £8m in 2002. Companies which are sensitive to the economic environment potentially offer significant upside in certain economic conditions. 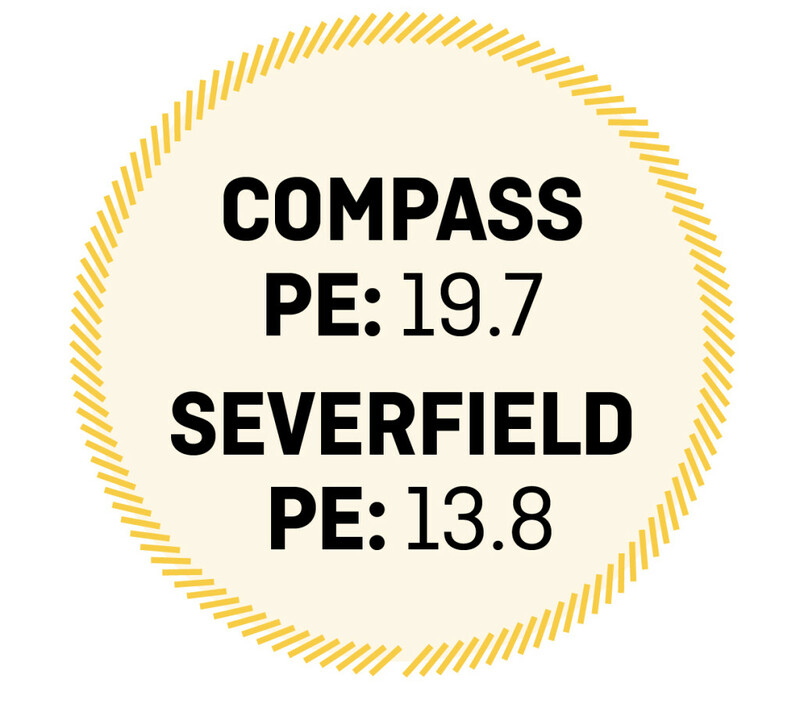 The upside at Severfield is exciting and plausible in light of current investor optimism towards cyclical stocks. However, it must be tempered to an extent. There remain a number of economic uncertainties in the UK in particular, despite markets appearing to price in better economic conditions. Recession in 2008 ultimately destroyed almost all the value Severfield was able to create in the mid-2000s. After going from 300p in the mid-2000s to £22 a share in 2007, Severfield traded as low as 40p in 2013. It now trades at 68.75p. The rise and fall of stocks like Severfield is a good illustration of the risks investors run when investing in super-cyclical companies, even if chief executive Ian Lawson has taken steps to improve the business’ through-the-cycle performance and balance sheet in recent years. So it would be a brave investor that ditched shares in a quality business like food and support services outfit Compass to buy Severfield’s stock. But investors should certainly keep an eagle eye out for signs of runaway growth over the coming years. 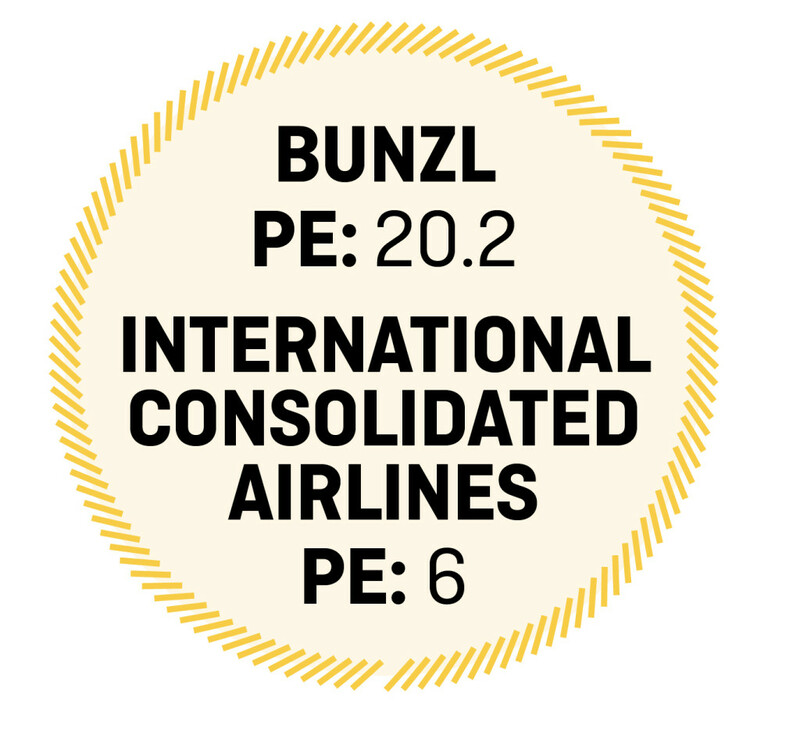 FTSE 100 Distributor Bunzl (BNZL) has delivered significant returns for shareholders over the years. It supplies goods companies need in order to do business every day. For example, it provides takeaway coffee cups, disposable gloves for hospitals and cleaning products for offices. These are not goods that are sold to the end customer; instead, they are essential items that a company requires simply to exist as a business. Therefore Bunzl is considered to be very defensive as its services are in demand in both good and bad economic conditions. Investors understandably have to pay a premium for this defensive characteristic and excellent track record of generating high returns. It presently trades on 20.2 times forecast earnings for 2017 and is expected to deliver 11% pre-tax profit growth in that year. In contrast, British Airways-owner International Consolidated Airlines (IAG) trades on a mere six times 2017 earnings. The airline sector has struggled with significant headwinds this year and is in the middle of a downgrade cycle for earnings. International Consolidated Airlines is forecast to see 13.5% decline in net profit in 2017 and for the dividend to be cut by 16.5%. So is the airline a bargain or in bargepole territory? Bunzl’s organic revenue growth has exceeded GDP growth in its key markets for nine of the past 11 years. Therefore it should theoretically benefit from improvement in global economies. We have been long-run fans of Bunzl and still think it is an excellent long-term investment. Our gut feeling is that Bunzl could soon be a lot cheaper to buy as the market rotates from defensives to cyclicals, so hold off buying at the moment if you don’t already own the shares. 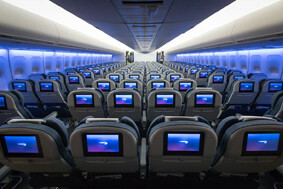 International Consolidated Airlines looks an absolute bargain at current prices and we’d prioritise that stock as an investment versus Bunzl at present. Near-term earnings weakness is fully priced in to the stock, in our view. The airline’s net profit is forecast to bounce back strongly in 2018. You should note that Middle Eastern group Qatar Airways has been building a stake and now owns 20.01% of the group. The rules state EU airlines must be majority owned by EU shareholders so a takeover by Qatar Airways is out of the question. International Consolidated Airlines is registered in Spain, so it would theoretically still be an EU airline post-Brexit. Both RELX (REL) and Trinity Mirror (TNI) occupy the media sector but they are worlds apart as businesses. This is reflected in their valuation. 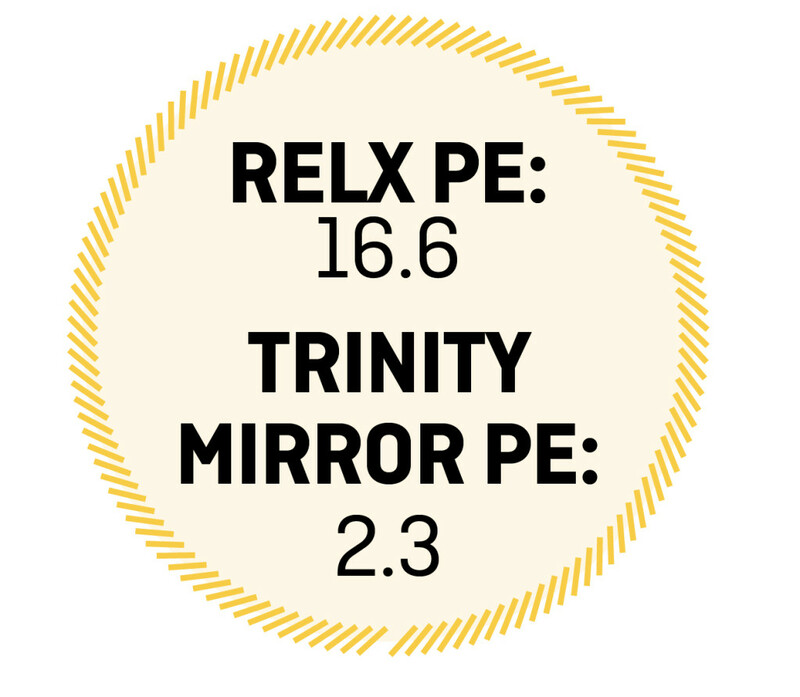 Professional information and events-organiser RELX trades on 16.6 times 2017 earnings while newspaper publisher Trinity Mirror trades on a forward PE of just 2.3. We continue to see a place for RELX in a long-term investment portfolio but a short-term switch from ‘expensive defensives’ to cyclical stocks means the scope for upside is significantly higher at its lower quality counterpart Trinity Mirror. At current levels Trinity is more or less being priced to go bust which we do not see as a realistic near-term prospect. The company is carrying a limited amount of debt bar its substantial pension liabilities. Advertising spend is very sensitive to the fortunes of the wider economy. Trinity Mirror could benefit if there is a return to earnings growth. The company recently updated the market to say full year numbers would hit expectations despite revenue falling 9% year-on-year in the third quarter. Trinity has been implementing a number of strategic initiatives which will deliver cost savings of some £20m in 2016, some £5m ahead of its initial target. Liberum analyst Ian Whittaker reckons there is some £600m worth of costs in the business and sees scope for further streamlining. The stock could re-rate if the decline in print advertising revenues slows and there is growth in digital advertising income. Liberum has a share price target of 275p, implying 244% upside. Even at this price the stock would trade on a PE of just 7.9. RELX’s (previously called Reed Elsevier) shares are up 15% year-to-date despite a recent wobble. The company has an excellent track record of earnings and dividend growth. It has a number of defensive attributes as well as being a significant dollar earner and therefore a beneficiary of sterling weakness. It is a publisher and provider of information solutions for professionals; made up of the following divisions: Scientific, Technical & Medical; Legal; Risk Solutions; and Exhibitions. These levels of growth may not be sufficient to hold the market’s attention in an environment where investors are flocking to higher risk, cheaply-priced cyclical stocks. Year after year of incremental revenue, profit, cash flow and dividend growth gives some indication as to why the market ascribes a premium rating to health and safety kit supplier Halma (HLMA). The near-£3.8bn company trades on 25.5 times forecast earnings for the year to March 2017 as it possesses a reputation for nearly always delivering the goods. That’s in stark contrast to TT Electronics (TTG). The electronic components supplier has been locked in recovery mode for the past seven years or so. Trading at 136p, TT’s shares are today barely half what they were 10 years ago. They peaked at 260p in late 2006. TT has battled gamely against multiple challenges, taking its sensors and other electronic components to new aerospace, industrial and medical markets alongside its core automotive interests. Operating cost challenges, steep pricing pressure from very large original equipment manufacturing (OEM) clients and largely damp demand held sway until recently. Are we at a turning point? We note a return to organic growth in the four months between 1 July and 31 October this year, albeit it by an unspecified rate and after stripping away currency, acquisition and disposal factors. Positive cash generation so far since July will also take a chunk off net debt, stated at £71m as of mid-2016. Those are promising signs. TT still trades on a fairly low rating for its sector at a mere 11 times forecast earnings for 2017. It has a 4% prospective dividend yield which is nearly twice the sector average. The current 136p price is certainly an attractive level at which to buy for a decent income and obtain part ownership of a company whose equity is ripe for a re-rating. TT’s relatively new management seem to have done a good job at steadying the ship. Now it needs to rekindle the growth spark. The astute acquisition of Aero Stanrew, acquired in December 2015 for £42.2m, will help. So will a gradually rebuilt order book. 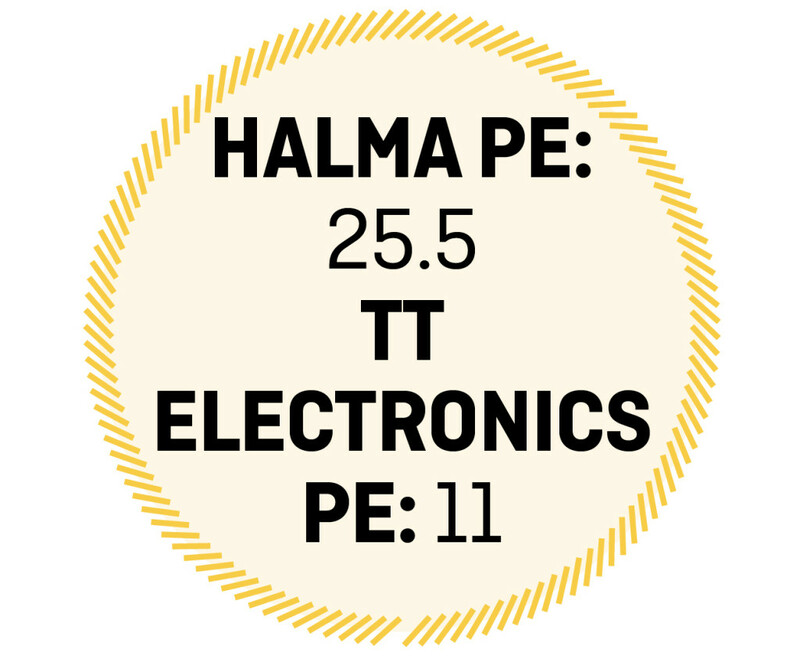 As for Halma, its sales have grown in 40 of the last 42 years. It has increased the dividend by more than 5% every year since 1979 which is a staggering achievement. Halma is a stock investors can tuck away for the longer-term without much worry, in our opinion. The flipside is that you have to pay a high rating for Halma and the stock has already enjoyed a big rally in the last 12 months. Alcoholic drinks giant Diageo’s (DGE) share price has retreated amid rotation out of expensive quality stocks and into cyclical businesses. This poses the question: should you ditch this branded premium spirits giant with an unbreachable economic moat and recycle profits into an out-of-favour consumer cyclical, such as bombed-out Sports Direct International (SPD). Shares in the sportswear purveyor have taken a hammering following disappointing results, profit warnings and a spat with politicians surrounding working practices at its Shirebrook warehouse in Derbyshire. Controlled by unconventional billionaire Mike Ashley, Sports Direct has seen weaker trading across its core sports retail businesses and taken a negative hit from sterling’s drop versus the dollar, with the market anticipating further currency-driven downgrades. For the year to 30 April 2017, Cantor Fitzgerald Europe forecasts a slump in pre-tax profit to £150m (2016: £275.1m), ahead of recovery to £175m thereafter. Based on the broker’s downgraded 19.8p earnings forecast, Sports Direct trades on a forward PE ratio of 16.1 falling to 14 times based on 2018’s 22.8p forecast. Those ratings are cheap relative to Sport Direct’s history though not bargain basement valuations as the earnings forecasts have come down dramatically. Nevertheless, there is scope for a significant re-rating should trading pick up and investor confidence in the story be restored. 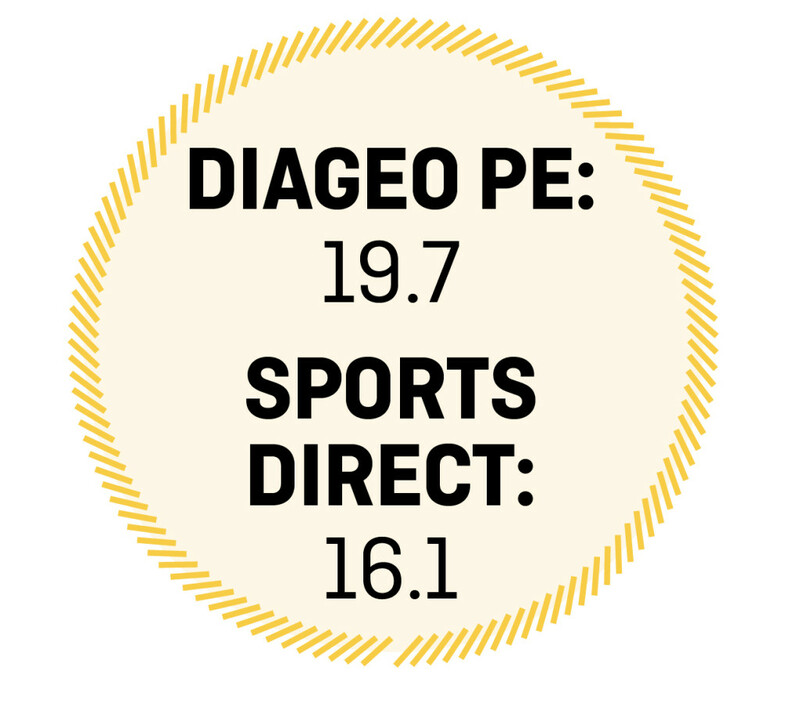 Despite trading on a much higher rating, we’d use the pullback at Diageo as an opportunity to buy shares cheaper, rather than speculate on an uncertain Sports Direct recovery. Strong intangible assets and a cost advantage lie at the heart of Diageo’s economic moat. 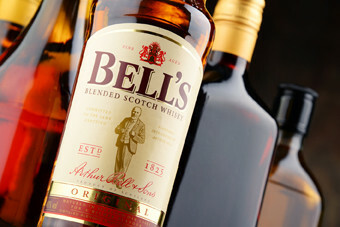 Its brand portfolio is outstanding, spanning Bell's and, Johnnie Walker whisky, Smirnoff vodka, global stout Guinness and Captain Morgan rum. These brands engender loyalty among consumers and represent a high, costly entry barrier for would-be rivals. And in contrast to Sports Direct, Diageo is a beneficiary of sterling weakness, being a major whisky exporter and deriving a significant amount of sales overseas. Earnings are geographically diversified and the drinks maker throws off copious free cash with which to invest in competitive advantage, acquisitions and progressive dividends. Key growth drivers for Diageo include scotch, the US spirits business and India, while the £51bn cap offers a compelling play on the ‘premiumisation’ trend in emerging markets too.